This page is dedicated to all of the people who were honored by loved ones purchasing the socks. The man who started this whole idea-Frederick Copeland Sr. Lymphoma, lung cancer, epiglottal cancer and tongue cancer. Ravelry User Carmina in honor of her father Geoff. Sufferer of liver cancer. 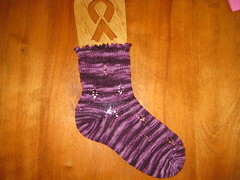 Ravelry User Albertina in honor of her Aunt Tina who passed in 2005 and her cousin Alessandra, courageously fighting now.